Here is a quick tutorial on how to make your own tambourine craft from paper plates! Here’s a fun art activity for toddlers to try: crayon rubbings! We had a great time painting with bubble wrap, so don’t throw this packing material away! These Valentines crafts for toddlers are super easy and perfect for celebrating all things hearts and Valentines. This week I decided that we should add some texture to our paintings, so we did made artwork with scrubbers, sponges and scourers! This ribbon blanket craft is really easy to make and you only need two small scraps of fabric and assorted ribbon. Here is a tear free bubble recipe that is really easy to make. It is also nice to be assured that the bubbles won’t sting your child’s eyes. This pipe cleaner toddler toy is easy to make and is a great introduction to some basic fine motor skills. Paper plates are super cheap to buy and are very versatile. Here’s how we made this cute paper plate fish craft! 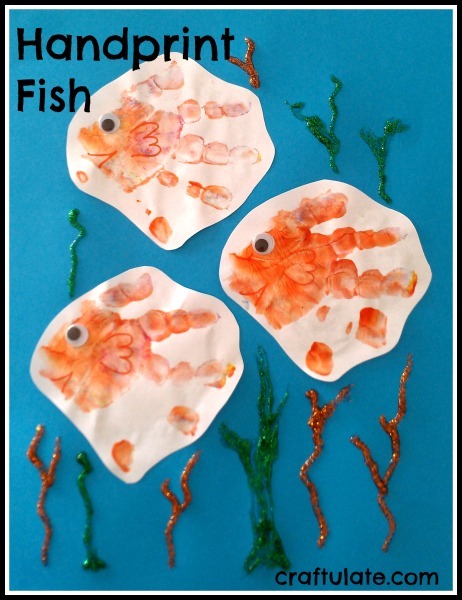 Turn messy painty hands into cute handprint fish art! This easy craft uses contact paper (also known as sticky paper or sticky-backed plastic) to make tissue paper collages. Here’s a super cute cow cake that I made for my son’s first birthday.